As initially reported late last week, Westworld has set up yet another immersive activation for fans who want to temporarily step out of reality and into the show’s universe. The latest incarnation has been created in conjunction with this weekend’s New York Comic Con, boasting the title ‘Westworld: The Experience.’ While very few people relative to the show’s large fan base will be able to immerse themselves in this experience in person, a group of reporters were invited to walk through the installation. And lucky for us, their descriptions paint quite a vivid picture. Once you find the appointment desk and confirm your attendance, it’s time to go in! After checking in with the host at the front desk (pictured at the top), you continue into the atrium. Alexander observes, “You’re treated to various weapons kept under glass. One of the actors saunters up next to you and whispers questions in your ear: ‘Which gun would you choose?’ ‘What do you want to do in Westworld?’ ‘Are you good or bad? '” I don’t know about you, but I’m pretty sure my answer would involve nervous laughter mixed in with partially audible noises, creating somewhat of a sufficient response to each question. A particularly intriguing part about the atrium is that it also features a series of screens that play clips from the show, including a brand new season 2 teaser. Perhaps this teaser will go wide over the weekend like the first one did during San Diego Comic Con? Upon completion of the questioning, the guest services representative recommends either the white or black hat for you to wear for the duration of your stay (and you get to take home with you!). Both Alexander and Khosla were given black hats to wear. I wonder what that says about them…. 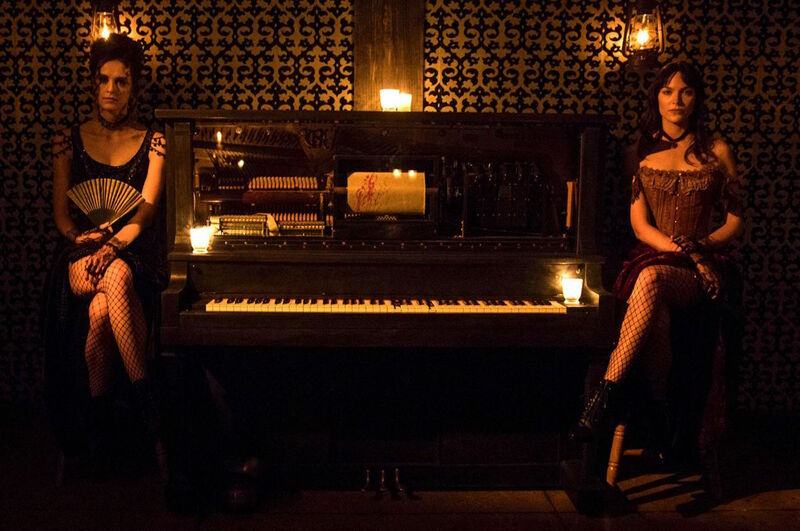 In the picture of the saloon’s piano above, it’s interesting to note that spatters of blood appear on the music scroll, similar to what we see in the first season 2 teaser. What do you think of ‘Westworld: The Experience’ now that you’ve been able to experience it secondhand? Will you have the opportunity to journey through it in person? Let us know! Westworld Releases Casting Call for Utah-Based Extras!